While thin steaks are ideal for portion control, getting a high-quality sear on them without overcooking the interior can be difficult. Searing is very important -- steaks with little to no sear have poor flavor and an unpleasant texture. Unfortunately, thin-cut steak -- regardless of how you prepare it -- will never reach the same level of sear as thick-cut steaks without overcooking. However, you can amp up the browning and crusting on the exterior of the steak while you cook it on the grill -- away from fatty cooking oils. Remove the steaks from the packaging and pat them dry with paper towels; rub their exterior with salt. Place the steaks on a wire rack placed over a baking sheet, loosely cover them with butcher or wax paper, and place in the refrigerator for at least one hour. Remove the steaks from the refrigerator and pat them dry with paper towels. Coat the exterior of the steaks with cornstarch, place them back on the wire rack and place them inside your freezer. 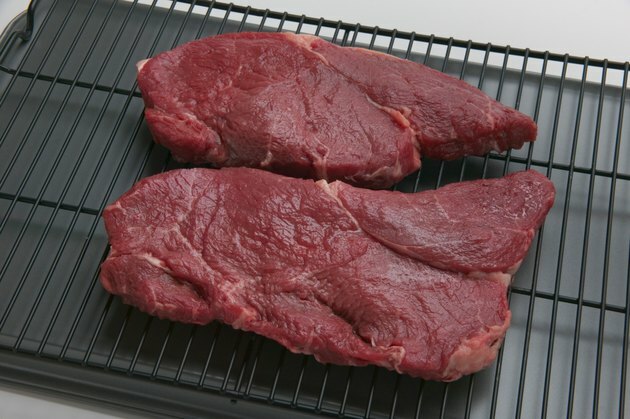 Freeze the steaks for approximately 20 to 40 minutes until firm and dry, but not fully frozen. Prepare your grill for high-heat, direct grilling; you want your grill as hot as possible for these steaks. If you are using a gas grill, turn all your burners to the high setting and preheat for at least 15 minutes before cooking. With a charcoal grill, remove the top grilling grate and light the coals using a charcoal or chimney starter. When the coals are blazing orange and red, spread them through the bottom of the grill using grill tongs or spatula. Replace the top grilling grate and allow the coals to continue to burn and ash over for about 5 to 10 minutes longer; the coals are ready when coated with a light grey ash. Clean the grilling grate using a wire grill brush to remove any grill grit. Rub the steaks with pepper -- preferably fresh cracked pepper. Place the steaks on a preheated grill at a 45-degree angle to the grill grate and cook for 1 to 1 1/2 minutes; then rotate the steaks 90 degrees and grill for an additional 1 to 1 1/2 minutes. Once the steaks are browned on one side, flip over and cook for 1 to 1 1/2 minutes more. Finally, rotate the steaks 90 degrees again and cook until the steaks are fully browned on both sides. Total grilling time should be between 4 and 6 minutes, depending on the thickness of the steaks. Remove the steaks from the grill onto a heated serving platter; tent with aluminum foil and allow the steaks to rest for 5 minutes before serving. The cooking times described are for thin-cut steaks, approximately 1/4- to 1/2-inch thick. Thicker steaks require additional cooking time. For good results with a thin steak, choose a cut that is tender and flavorful; tougher cuts are not ideal for high-heat direct grilling. Thin steaks that direct grill well include strip loin, ribeye, hanger steak, flat-iron steak and flap steak. Hanger steaks are particularly low in fat, but they are tender and flavorful. The purpose of the cornstarch and the stay in the freezer is to dry the exterior of the meat as much as possible before cooking; freezer and cornstarch both draw out moisture from foods. The Maillard reaction, the browning action that happens during searing that turns simple proteins and sugars into complex, delicious flavor compounds, requires high heat and a dry environment. The wetter the steak, the longer it takes to start this reaction. For thin steaks, you want to ensure the reaction happens as quickly as possible. If you are grilling with a charcoal grill, use lump charcoal, which burns hotter than briquettes, for better results with these steaks. Additionally, lump charcoal lacks the additives and binders, which can give off strong chemical aromas when lit, that are used to make charcoal briquettes. The USDA recommends a safe internal cooking temperature of 145 degrees Fahrenheit with a 3 minute rest. (Ref 3) If you want to accurately check internal temperatures, utilize a meat thermometer inserted into the interior center of the steaks. Be aware, however, with thin steaks, it may be difficult to get a perfectly accurate reading with some meat thermometers.